Since making his debut for Celtic in 2015, Kieran Tierney has gone on to become one of the most important players for the Glasgow club. As well as playing a major role in securing a historic ‘double treble’ for the Hoops, the 21-year-old defender has also gone on to collect personal accolades winning the Players’ and Writers’ young player award for three consecutive seasons. Kieran was also recognized for his performances in the Champions League last year and was named as one of the best young players to look out for this season by UEFA. And while the Bhoys saw their Champions League adventure come to a premature end, it hasn’t stopped the gifted Scot from making an impression in continental football’s less glamorous tournament. 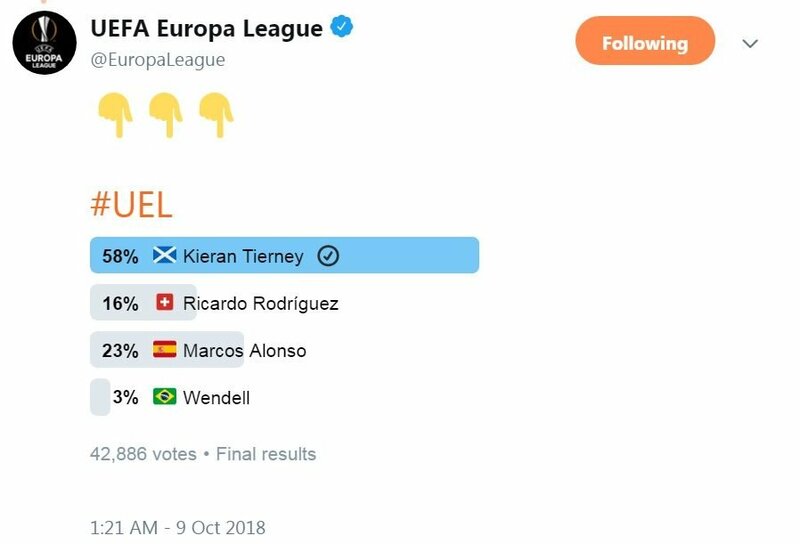 An official poll conducted by UEFA Europa League’s official Twitter account has revealed KT to be the best left-back currently playing in the Europa League, comfortably beating players from top sides like Chelsea’s Marcos Alonso, AC Milan’s Ricardo Rodriguez and Bayer Leverkusen’s Wendell.